What is the online placement test? 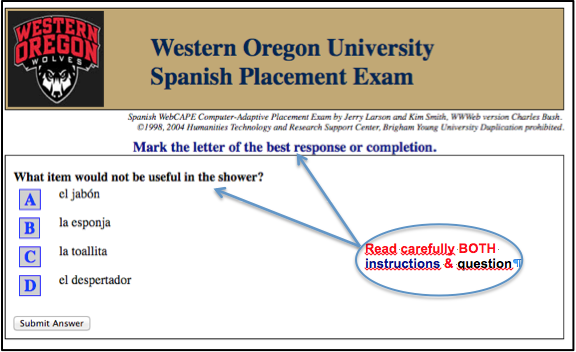 Students who have had previous study of French, German or Spanish in high school and intend to continue in the language must take the online WebCAPE placement test to determine which level of course to register for at WOU. The department will review the results of the placement examination in conjunction with other information, such as number of years that the language was studied, grades earned, etc. The department reserves the right to change the student’s placement if it believes that the student has not been placed at the most appropriate level. 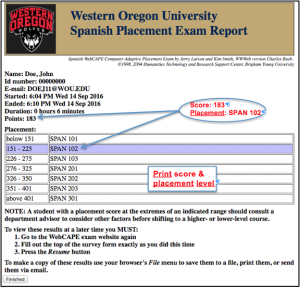 Who needs to take the online placement test? Incoming freshmen who have earned high school credits in French, German, or Spanish and are in one of the colleges that require a language must take the placement test. 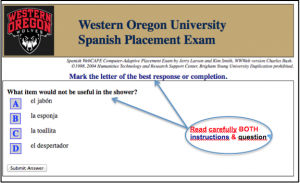 What do I need to take the online placement exam? 20 – 30 minutes depending on your skill level of the language. 1 or more years in French, German or Spanish in high school. Your V-number. If you do not have your V-number when registering for the exam use your last name and then first name. If you have not studied French, German or Spanish, register for course level 101 in the respective language. Level 101 is an elementary level and you do not have to take the placement exam. Take the exam only once. Online placement test for students who studied French, German or Spanish. Print your results and bring them to your advisor, you will need this information during the registration process. 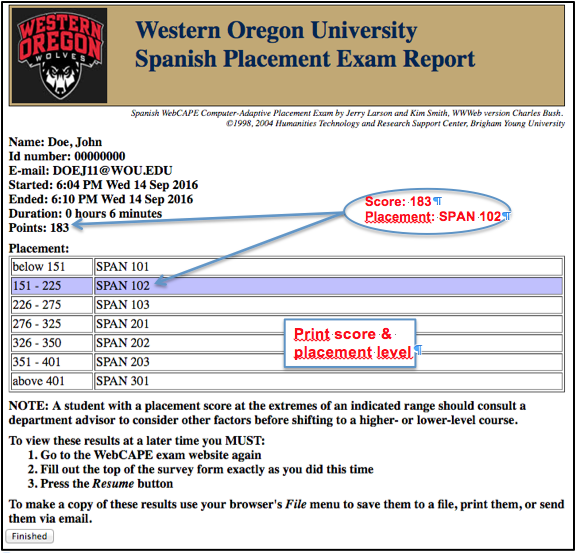 What does the online placement results page look like? What is important when taking the placement test? What if I am a native or heritage speaker of French? Students who plan to continue advanced study of that language must first take the placement exam in that language to determine the level of proficiency. After taking the exam and obtaining their results, students must consult with the advisor in that language (ivalm@wou.edu) before registering for an advanced foreign language level.